What a night of football in Franklin. After five parachutes dropped out of the sky, gun salute, and national anthem the Franklin Wildcats and Carlisle Indians finally took the field. After a back and forth battle, and many penalties, Franklin's Kennard hit Devin Richards just before half to tie up the game. Carlisle 7, Franklin 7. Second half, Carlisle had another long drive that ended with a miss field goal. The penalty bug struck the Indians, as well. Neither team could get any offense going in the third. Carlisle 7, Franklin 7. In the 4th quarter, Franklin's offense woke up. In particular, Senior leader and starting running back, Chris Hymer. Hymer carried the ball 19 times for 142 yards. The 4th quarter, Hymer broke off a 34-yard run to to the Indians 2 yard line. From there, Hymer dove in for the score giving the Wildcats a 14-7 lead. After an Indians failed attempt to move the ball. Franklin marched down and Kennard scored on a QB keeper. The Indians made a couple nice final attempts in the closing minutes. 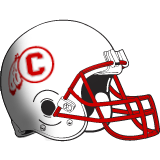 With less than two minutes Carlisle's Boyer hit Gideon Cunningham for a 30 yard TD pass. But it wasn't enough, Franklin gained possession on the kick off ending the game. Final Score Franklin 20, Carlisle 13.